The Hallicrafters, Inc. - Sky Buddy Series - 5 -T "SKY-BUDDY", S-19 & S-19R "Sky BUDDY"
To ensure that the purchasers knew who the intended users of the 5-T Sky Buddy were supposed to be, the first few production runs included a picture of a "young ham sending with a bug" on the dial. A close-up of the dial is shown in the photo to the left. The 5-T was successful and popular. So popular, in fact, that many adults were buying the receiver for their own use. In a short time, Hallicrafters removed the "boy dial" and just used a plain dial with "SKY BUDDY" written across the center. Maybe this was to make the receiver look less like a kid's toy and more like a serious ham receiver. Note in the close-up of the "boy dial" that the boy is depicted using a semi-automatic telegraph key (bug) and is listening using "phones" just like a "pro." Of course, the vest and tie help for that future job interview to get into professional RADIO! The "no boy" model 5-T was produced up to around 1938. By then the airplane dial was becoming passé and Hallicrafters had been using an external metal dial on their larger receivers so the Sky Buddy was revamped with a new dial and a few tube changes. The model number changed to S-19 Sky Buddy. Later, in 1939, other improvements warranted another model number change to S-19R. The major features of the S-19R were the added band spread dial and another tube to the circuit bringing the total to six. The price was also increased to $39. The early S-19R receivers use toggle switches but the very late versions (just before WWII) replaced the toggle switches with slide switches. After WWII, the Sky Buddy returned,... well, the concept of an "entry level receiver" returned. The new version was designated the S-38. The S-38 eliminated the AC power transformer used in the pre-war Sky Buddy and went with an AC-DC circuit. Six tubes were used in the first S-38s but soon that was changed to five tubes when the BFO became a gimmick in the IF to cause oscillation and the Noise Limiter circuit was dropped altogether. Still, many hams remember the S-38 as their first exposure to shortwave reception and the little receiver was an amazing SWL performer given its obvious limitations. 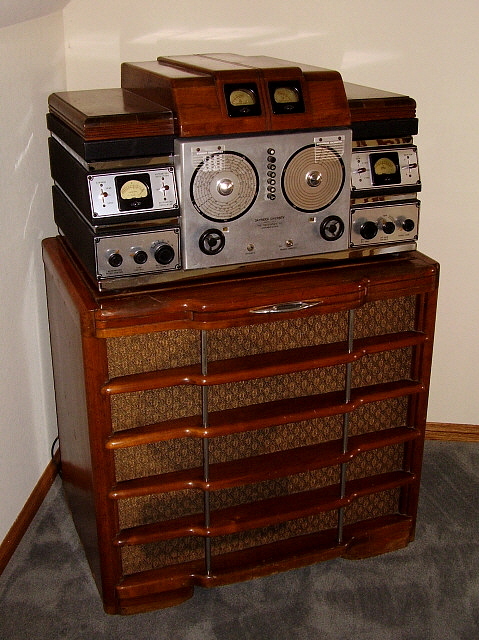 The S-38 went through a series of upgrades running from the S-38, S-38A, B, C, D and E. Also, a faux mahogany cabinet S-38EM along with a blonde finish cabinet S-38EB. Ultimately, the Sky Buddy name returned with the S-119 receiver (also available as a kit, S-199K.) Although the idea and goals of interesting youths in RADIO was still somewhat popular, times had changed with television encroaching into the domain of RADIO with the ham often viewed as a TVI nuisance to the neighborhood rather than the valuable emergency asset he could be. The S-119 Sky Buddy II never gained the popularity or memories of the original Sky Buddy or the S-38 Series. Nostalgia certainly drives the collector market for Sky Buddy series. The performance of these receivers is very limited with rampant images since no RF amplifier was used in any of the series. They are easy to restore and when operational hopefully will bring back memories of youthful excitement when receiving signals from foreign countries. 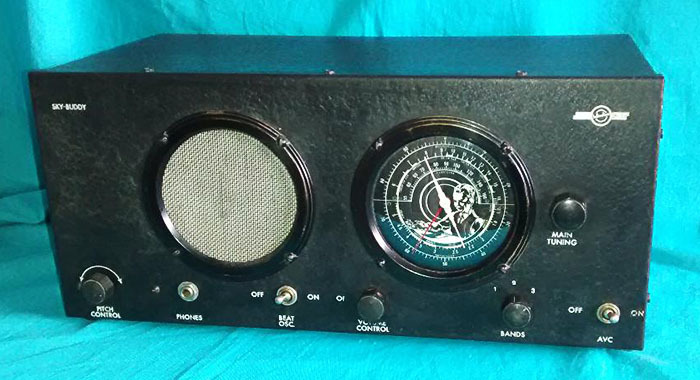 Go to our webpage "Post WWII Ham Gear" for more info on the Hallicrafters S-38 series. Navigation link below in the Index. photo right: 1941 Sky BUDDY S-19R. Note that this version has Band Spread. On all of the pre-WWII versions of the Sky Buddy, the speaker grill is flocked with a mohair felt that is usually dark brown or olive-brown color. On nearly all examples found today the flocked felt has fallen off or has been rubbed off so that only the wire screen part of the grille is left. 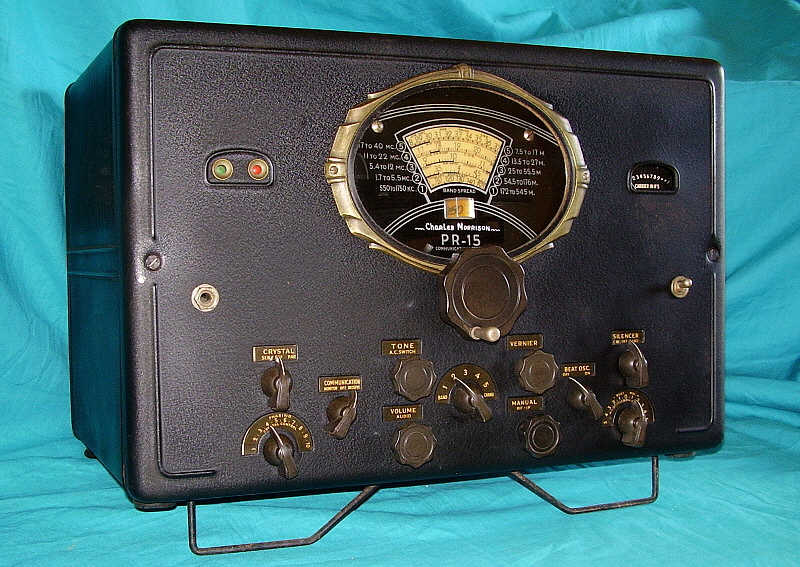 The RME-69 was announced in November 1935. Using nine tubes, a stout chassis and a tight, compact layout, the RME-69 provided the user a receiver with lots of sensitivity along with great performance features and a tuning and bandspread dial system that was "velvet smooth" - even though the dial nomenclature was miniscule. At least the dials were significantly larger than the RME-69's predecessor, the RME-9D, with its small round airplane dials that were almost impossible to read. Also, the tubes were now 6 volt heater types, e.g. 6D6, 6C6, 6B7 and 42 with an 80 rectifier. The "Compensator" control (located between the two main tuning knobs) allows the operator to keep the RF and Mixer stages "peaked" for any frequency tuned. "Stand-by" is actuated by pulling the Audio Gain control knob. A terminal on the rear chassis allows the station transmitter's AM signal to be monitored through the receiver. The Carrier Level meter is calibrated in both "R" units and in db (with 48db equal to R-9.) 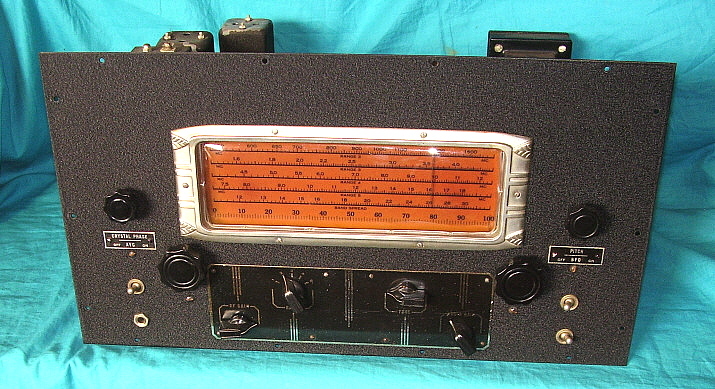 The standard RME-69 covered .55 to 33MC and sold initially for $135 - the price was raised to $151 in 1937. Throughout production various improvements were incorporated into the design. The RME-69A was an AC or Battery operated version and the RME-69B was battery operation only. Late in production changes were made to the mounting of the BFO switch and headphone jack, the mounting of the two dial lamps and the Crystal Filter design. Another late offering was the Lamb Noise Silencer, designated as the LS-1 option (there was also an LS-2 variation for battery operation.) The LS-1 added two extra tubes to the circuit and changed the IF amplifier tubes to metal octal types. A popular RME accessory was the DB-20 Pre-selector, introduced in October 1936. It provided the user with two tuned RF stages ahead of the RME-69 with an advertised gain of 20 to 25 db along with reduction of images. When the RME-69 was used with a DB-20, three tuned RF amplifiers were in operation - sensitivity was incredible and images were no longer an issue. A VHF Converter was also available. RME also offered the DB-20 and the RME-69 installed into one very long cabinet. The matching speaker is mounted in an unusual trapezoid shaped cabinet that allowed for a bench corner to be used for the speaker location and then rectangular equipment cabinets could be butted against each side of the speaker cabinet. Early versions of this speaker cabinet used Rola speakers while late versions used Jensen speakers. In 1939, the RME-70 was introduced and the RME-69 was slowly phased out of production. About 6500 RME-69s were built from 1935 up to about 1940. Shown in the photo above is our 1937 RME-69 SN 1931 with its matching speaker and matching DB-20 Pre-selector. Serial numbers on early receivers are numerical and are probably actual sequential numbers for the quantity of receivers built. Around 1938-39, the serial numbering system was changed to a letter-number combination that probably represents sequentially numbered receivers within specific production runs with the production run identified by the letter used in the serial number. If you are aligning an RME-69 be aware that it has a decidedly different front-end with no trimmers to compensate for variations in the coil windings of the RF or Mixer sections. This was because the coils were all pre-tuned before assembly and all coils should be identical from receiver to receiver. Whether they have aged the same over the past 70 years is an unknown but most seem to have weathered time quite well. Since the alignment requires some special information, it is lucky that the quirky alignment procedure is in Rider's VOL. X. When aligning the RME-69, it will be noted that the adjustments for the LO are compression trimmer capacitors which are notorious for not "holding adjustment." RME, more than any other communications receiver company, believed that the "ham owners" of their receivers were "tinkerers" - the type that was always adjusting this or aligning that. The fact that the LO might need adjustment every few months didn't bother that sort of owner and apparently didn't bother RME either. The RME-69 by itself is a typical late-thirties performer, however when rebuilt and aligned, the RME-69 used with the DB-20 preselector is an almost unbeatable vintage receiver. It will be noted that some of the components used in construction are somewhat on "the cheap side." Also, it appears that several parts are just AM BC radio parts that were purchased to construct the receiver. Although Hallicrafters made their reputation on using purchased parts to construct their receivers, RME didn't have that sort of reputation. RME's style of advertising promoted the "engineering" side of design rather than the source or quality of the components used. Still, the RME receivers do perform quite well when rebuilt and aligned correctly. In 1940, Gordon Harris became the youngest licensed ham in the state of Nevada at the age of 12. His father bought him this RME-69 with the LS-1 Lamb Noise Silencer along with the DB-20 preselector and matching speaker - all rack mounted in an RME table-top rack assembly. Quite a receiver for a young ham but Gordon was a genuine enthusiast. 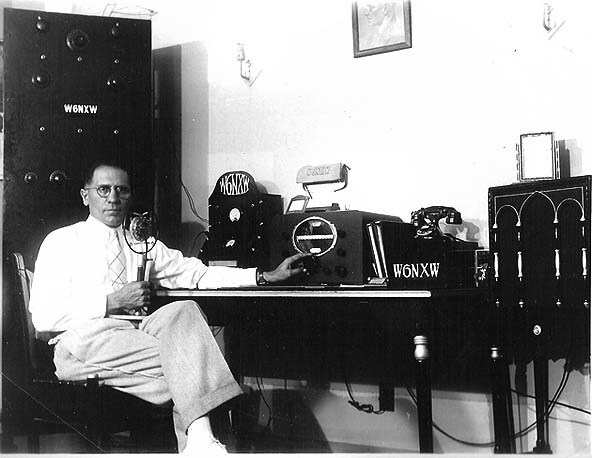 He also became Nevada's youngest holder of a FCC First Class Radiotelephone License at the age of 16. He was hired by radio station KOH in 1944, when station manager Bob Stoddard couldn't find any FCC-licensed engineers available due to the demands of WWII. Gordon's "read-the-copy" test was a dismal failure. Those of us who knew Gordon's rapid-fire, whispery voice knew he'd never be an announcer on KOH. Instead, he was put to work at KOH for his technical abilities, working after school and on weekends. After WWII, Nevada went from the sixth call district to the seventh and Gordon's call became W7UIZ, which he kept until he became an SK in 2012. It's very rare for a ham to have kept his original receiver, especially over a 72 year period of time. I was given Gordon's old receiver by his son in 2015. 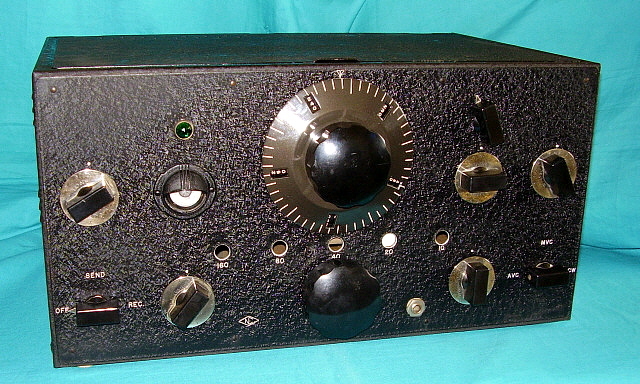 The RME-69LS-1 is a very late version of the receiver with the BFO switch being a toggle switch located in the lower left corner of the panel. The Crystal Filter is the late version without the "series-parallel" function. In the lower right corner is the Noise Silencer control. The Lamb Noise Silencer was only used in a few receivers (with the Hallicrafters SX-28 being the best known.) The Lamb NS actually is a tuned-IF noise blanker that works quite well on both voice or cw. It required two extra tubes and one IF tuned transformer. The Lamb NS is built onto a small chassis (which also has the two IF amplifier tubes mounted on it.) 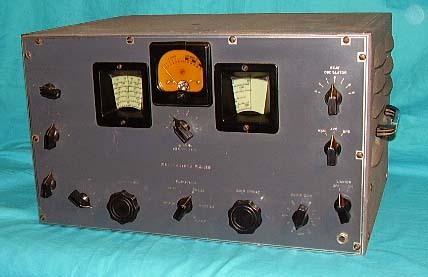 The LS-1 version of the RME-69 uses a 6L7 and a 6K7 in place of the older two 6D6 IF amplifier tubes. The Noise Silencer uses a 6J7 and a 6H6. The DB-20 is a two-stage TRF preselector that was a very popular accessory for the RME-69. This version is rack mounted with a full size 19" front panel. The speaker panel uses the standard 8" Jensen PM speaker with matching transformer. All of the panels are .190" aluminum finished in gray wrinkle paint with engraved nomenclature. Normally, RME didn't provide any panel control information believing that the ham should know his receiver and know the functions of the controls without any nomenclature required. This rack mount RME-69 is somewhat of a departure from that belief and all control functions are well-identified with engraved nomenclature. Radio Manufacturing Engineers, Inc. was very successful during the 1930s and was certainly a true competitor to the "Big Three" (National, Hammarlund and Hallicrafters.) However, RME didn't evolve from their 1930s design concept and, after WWII, the company began to stagnate. With new ownership under ElectroVoice in the early 1950s, a few newer models emerged. The most famous was the very modern RME-6900. ElectroVoice sold the RME name to G.C. Electronics in 1962. The RME name faded away shortly after. Hammarlund spared no expense to build the very best communication receivers available from the mid-thirties through most of the 1940s. Uncompromising quality made the Super-Pro the choice of professionals, both military and commercial, along with the few well-to-do hams who could afford the $400 list price (though most discount dealers offered the Super-Pro with Crystal Filter for about $250.) Designing began as early as 1933 (when it was referred to as the "Comet Super-Pro") but the official QST introduction wasn't until March 1936. 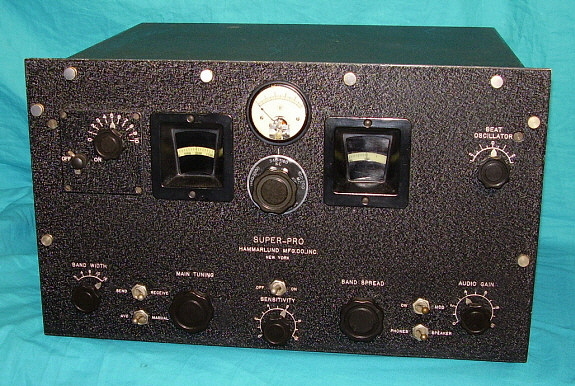 Hammarlund had the Super Pro ready long before March 1936 however and was supplying the Super Pro receiver to the U.S. Army Signal Corps as the SPA receiver. The order number was 10932-NY-35 and is dated June 29, 1935. The SPA is identical to the Super-Pro that was introduced nine months later, indicating that as far as Hammarlund was concerned, the Super Pro was ready mid-1935. The Super-Pro used several custom designed parts, including its variable-coupled air-tuned IF transformers, its silver-plated cam-operated bandswitch and its four-gang main tuning condenser and twelve-gang bandspread condenser. Using 16 tubes, the circuit featured double pre-selection on all bands with 25 individual laboratory tuned coils mounted on 20 Isolantite bases, frequency coverage from .54-20MC, amplified AVC, front panel adjustable BFO and 0.5% dial accuracy (incredible for the time.) The variable-coupled IF transformers allowed the user continuously adjustable IF bandwidth from 16KC down to 3KC. Separate RF Gain, IF Gain and Audio Gain controls were used and even a Tone Control was provided. A separate power supply was included in the purchase price (along with a speaker.) The power supply provided three levels of B+ voltage, -C bias voltage and tube heater voltage, all connected to the receiver via a five foot long, nine wire cable that had a special terminal strip type connector on each end. The first Super-Pro, commonly referred to as the Model SP-10, used all glass tubes with vented shields on the all but the audio tubes. The audio section including triode connected P-P 42s driven by another triode connected 42 with potted audio transformers with an 8 ohm Z output. Some SP-10 receivers had a 600 ohm Z audio output that added resistors to the audio line output to achieve a 600 ohm Z while utilizing the standard 8 ohm Z transformer. The first, second and third IF transformers were variable-coupled and cam/lever controlled from the front panel Selectivity control. Additionally, the Input and Output IF transformers for the Second Detector and the Output transformer for the amplified AVC were also variable-coupled but adjustable via knurled nuts on threaded shafts that protrude out the top of each transformer housing. The front panel was .190" thick aluminum finished black wrinkle then engraved so the nomenclature would appear bright silver (when it was clean.) The separate power supply was designed to utilize the field coil on the standard 8"speaker (a 12" deluxe speaker was available at $25 extra.) The speaker was just that - a speaker, no cabinet was supplied. The Tuning Meter was not illuminated and had an arbitrary 0 to 5 scale (but with 50 divisions!) Since it measured total IF amplifier plate current, stronger carriers would increase the AVC voltage, reducing the IF gain thus resulting in a lower reading on the meter scale. When tuning in AM stations, one would tune for the lowest reading on the meter. Signal reports were based on the difference between the "no signal" meter reading versus the "signal' meter reading to calculate "db over noise." Bandspread was only operational on the upper three frequency ranges and used a 0-100 logging scale. The crystal filter option was designated with an "X" suffix added to the model type. In mid-1936, an "S" version was offered that had coverage from 1.2 to 40MC with bandspread on all five tuning ranges (identified with an "S" suffix.) This model was advertised extensively in ham magazines of the day. 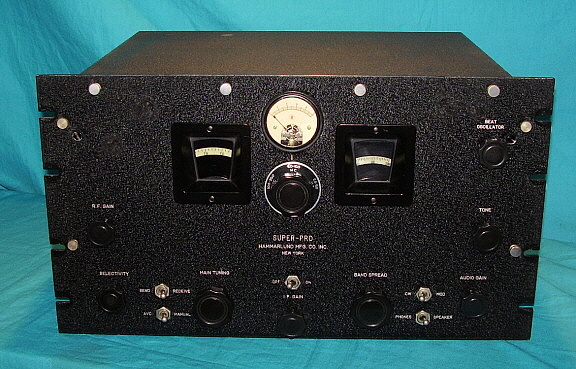 The SP-10 designation is a later identification addition, when new, the receiver was just advertised as the "Super-Pro." 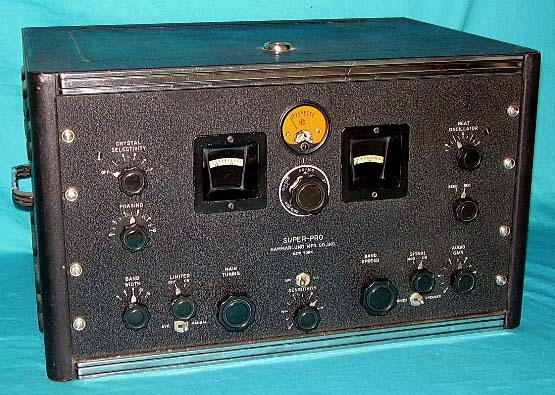 The SP-10 was in production for only nine months but, if the SPA is included as a SP-10 receiver, the production lasted about a year and a half. The SP-100 series Super-Pro was introduced in January 1937. Changes included going to metal octal tubes in the RF front end and in the audio section - eight tubes in all were changed (2-6K7, 6L7, 6J7, 6C5, 3-6F6,) the other eight tubes remained large glass tubes, (3-6D6, 6C6, 2-6B7, 5Z3 and 80 - the 80 was a change from the 1-V tube used in the earlier supplies.) The separate RF and IF Gain controls of the SP-10 were combined into a single Sensitivity control on the SP-100. The "knurled nuts" adjustable-coupling Second Detector Input and Output IF transformers and the adjustable-coupling Amplified AVC Output transformer of the SP-10 were changed to fixed-coupling units on the SP-100. The front panel was still .190" thick aluminum, wrinkle finished then engraved and now reference scales were added to the BFO, Bandwidth, AF Gain and Sensitivity. The "unique" Tuning Meter remained unchanged but the audio transformers were changed to vertical mount, frame-types with 8 ohms Z audio output. Added to the rear chassis apron was a two input pin jack socket that provided a remote relay access to control the receiver B+ by paralleling the Send-Receive switch. Around the same time the size of the standard speaker was increased to 10 inches. The standard power supply still had field coil connections on all versions but chassis space was provided for the substitution of a filter choke to replace the speaker field coil which then allowed the use of a PM speaker. Although not mentioned in advertising, an "L" version was available that included low frequency coverage 100-200KC and 200-400KC in place of the .54 to1.25MC and 1.25-2.5MC bands. A special SP-100X was built for Swedish government use, the Markradiomottagare 5, or MRM-5. These receivers were standard SP-100X configuration except for the frequency coverage - 200KC to 400KC and .54MC to 10.0MC. The Swedish manuals are dated 1937. Hammarlund always used "Series 100" in their advertising but model designations in their sales literature usually are SP-110 or SP-120 with 10 or 12 denoting the speaker size in inches. Model designations also include suffixes that identify the tuning range and installation of a crystal filter - "no suffix" tunes .54 to 20MC, "S" tunes 1.2 to 40MC or "L" tunes 100-400KC and 2.5-20MC. The addition of an "X" suffix denotes the installation of the crystal filter option. The serial number on all Super-Pro receivers is located on the rear apron of the chassis, stamped into the metal. Great sensitivity and fantastic audio with continuously variable selectivity make the pre-war Super-Pro receivers a natural for a vintage AM ham station today however they are seldom encountered. Probably because the early models are quite rare and the later 200 Series receivers are usually the military versions that are commonly found in an abused condition requiring extensive electronic and cosmetic restoration. When rebuilt and aligned, the Super-Pro is an incredible performing receiver with tremendous audio capabilities. 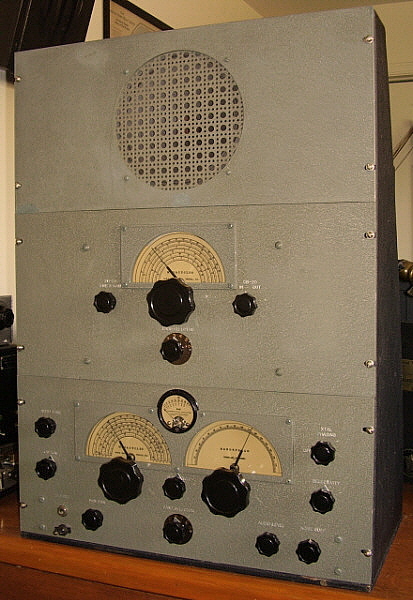 Shown in the top photo is the 1936 "Super-Pro" SP-10 SN:576 receiver that was used at WMI, a Lake Erie ship-to-shore radio station located in Lorain, Ohio. This receiver was totally restored to original, "as delivered to WMI" condition and its performance is terrific with powerhouse audio. The lower photo is our 1937 SP-100X SN:3387 receiver that has also been totally restored to original. Performance is phenomenal and the receiver is pleasure to use. More information on the "200 Series" Super-Pro further down this webpage. For the ultimate source of detailed information on the Pre-WWII Hammarlund Super-Pro receivers, including Product History, Estimated Production, Serial Number Assignments, Performance and Restoration, click on "Hammarlund Mfg. Co., Inc. - The Incredible Pre-War 'Super-Pro'" in the index at the bottom of this page. 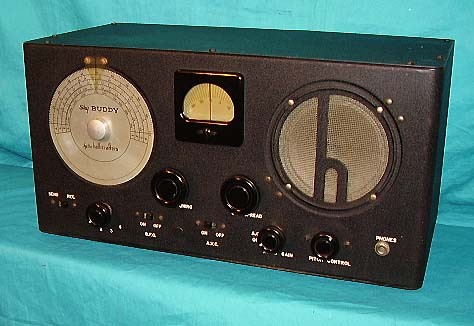 The SX-11 was a major step forward for Hallicrafters. As a continuation of the design and manufacturing style that was used with contactors, Hallicrafters' engineers designed the SX-11 to be built from purchased parts that could be assembled into a first-rate communications receiver. The SX-10 and SX-11 were the first receivers that Hallicrafters built without the use of contractors. The SX-11 boasts several firsts for the company. It was Hallicrafters' first receiver with Push-Pull audio output, first with a tuning-eye tube, first to use a separate speaker. The 11 tube superheterodyne circuit also has such unusual features as variable injection BFO, 0-200 bandspread scaling, illuminated main dial, 6L6 tubes in the P/P audio output (14 Watts of audio) plus the fabulous styling that remained in the Hallicrafters line for the next several years. The SX-11 evolved during production with early versions sporting SX-9 type knobs and several circuit differences from the later versions. From the factory, the SX-11 was housed in a metal enclosure painted black wrinkle but the advertised SX-11 was also sometimes pictured in an after-market, shielded, solid-walnut cabinet. These wooden cabinets were not a Hallicrafters' product but were available from various "jobbers" during the thirties. The NC-100 was introduced in 1936 and was National's first successful receiver to not use plug-in coils. Though National's Chief Engineer and General Manager, James Millen, insisted that the best receiver performance was achieved using plug-in coils, National's mechanical engineers offered a solution with the NC-100 receiver, the first in a series of "Moving Coil" receivers. The "Moving Coil" system consisted of a movable cast metal coil box (sometimes called a "catacomb" by collectors) contained all of the coils mounted in individual shielded compartments with short contact pins mounted in molded insulators on top of the coil box. photo above: 1937 National NC-101X SN: 181-G The band selector knob turned a rack and pinion gear mechanism that moved the coil box horizontally under the chassis. The coil box was supported by a rod shaft in the rear and the gear shaft pin riding in a cast slot in the front. Rotating the band selector knob would move the coil box into place, engaging the proper coil set pins into short, fixed contacts mounted under the tuning condenser. The mechanical action simulated plugging in a three coil set for each band with the ease of turning a knob while keeping all of the unused coils isolated and shielded. The Micrometer tuning dial, the PW-D, used on the early NC-100 is gray-blue with a red inner readout. 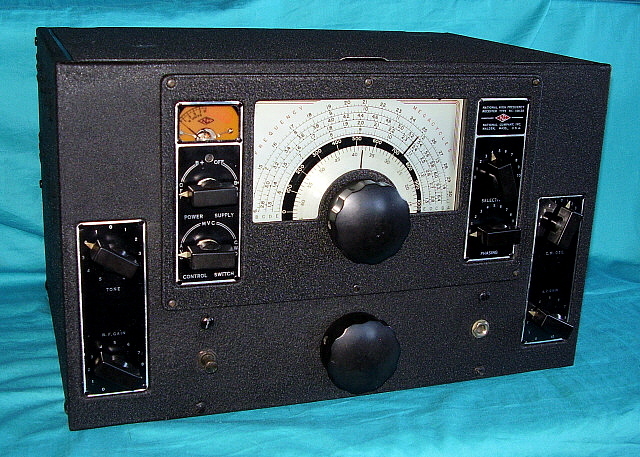 The NC-100 Art Deco front panel was only used for a short time, ending as early as run-G. The receivers were black wrinkle finish afterwards. NC-101X receiver cabinets are all black wrinkle finish and generally use the same black PW-D dial as the HRO. All NC-100 Airport receivers had a gray PW-D installed. There was a "reduced cost" AC-DC version "Moving Coil" receiver that was available as either General Coverage or Ham Bands only, the NC-80X and the NC-81X. These receivers feature a slide rule-type, direct-read dial rather than the PW-D micrometer dial. There was an optional power transformer available that could be mounted on the chassis to provide AC operation and isolation from the power line. The NC-80X/81X was available from 1937 to 1939. The initial selling cost was $88 but, by 1938, the price was increased to $99. The NC-80X used ten tubes but didn't have an RF amplifier. National raised the IF to 1560kc which put the image frequency so far from the tuned frequency that it was pretty much rejected by the natural selectivity of the tuned Mixer stage. The coil catacomb is much smaller than the NC-100 catacomb since only two coils set per band are used. Since the catacomb is smaller and lighter weight, a chain drive is used to move the catacomb rather than the rack and pinion used in the NC-100. Audio output is a single 25L6. The NC-80X never sold very well since the price was fairly high for an AC-DC type receiver. With the accessory speaker the price was over $100 and there were several receivers available in that price range that weren't so "quirky" in design. Though the NC-80X could provide excellent sensitivity and selectivity, its mechanics were "flimsy" and seemed cheap. photo above: 1937 National RCE Airport Receiver In 1937, the Department of Commerce, Bureau of Air Commerce contracted National to build rack mount NC-100 receivers that tuned 200kc to 400kc rather than tuning the AM-BC band. The first in the series was the RCD. The RCE (shown right) that followed had several updates to improve the receiver for airport use. By 1938, the Civil Aeronautics Authority (CAA) was created and then that government body contracted for the remaining versions of the "Airport Receivers" built by National. The CAA versions start with the RCF. 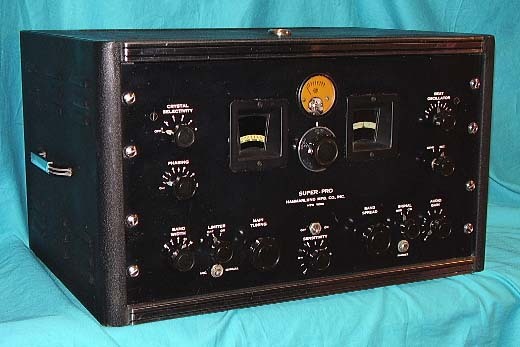 The use of National NC-100-based receivers at airports continued post-WWII when some earlier versions were professionally modified into the RCP and the RCQ versions. By 1940, the NC-200 was introduced which combined both general coverage coils and ham band coils into one catacomb allowing the users both options in one receiver and thus eliminating the need for either the NC-100XA or the NC-101XA. The NC-200 is profiled further down this page. The introduction of the NC-200 (in 1940) wasn't the end of the NC-100A or NC-100XA receivers however. The military had been ordering versions of these receivers since about 1939. When the USA entering into WWII, both the Navy and the Army ordered thousands of National receivers. The Army designation was NC-100ASD and this receiver had the AM BC band replaced with a 200kc to 400kc band. The Navy had the RAO Series. The versions from RAO-2 and up to RAO-9 have two RF amplifier stages for maximum reduction of LO leakage to the antenna. The Navy also ordered the RBH receiver with better coverage of the medium wave bands due to its 1500kc IF. See "WWII Receivers and Post-War Ham Gear" webpage for more information on these WWII versions. For the ultimate in detailed information on the NC-100 Series "Moving Coil" receivers, including Airport Receivers, Military Receiver versions, serial number analysis and restoration suggestions, go to our web-article "National NC-100 Series - Moving Coil Receivers" - navigation link below. Why did James Millen Leave National? - James Millen left National in May 1939, officially to form his own company, James Millen Mfg. Co., but here's what Millen himself had to say about his leaving, as told to John Nagel K4KJ and reported in Nagel's "Brief History of the National Company, Inc."
National had been successfully building its reputation as a top shortwave communication receiver company. The sales and designs coming out of National were at the cutting edge. Unfortunately, the majority share holder at National Company, one Warren Hopkins, wanted National to suddenly change directions. Hopkins wanted Millen to switch emphasis from shortwave communications equipment and go into the consumer "home radio market." Hopkins thought this change would expose more of the public to National products by supplying "Wards" or "Sears" with home radios. Millen was adamantly against National changing direction. He had worked for the past eleven years to put National as the leader in shortwave communication receivers and, to Millen's dismay, it seemed that Hopkins (and perhaps some others in the company) wanted to abandon this successful business position. Millen resigned but National never went into the home consumer radio market at that time. Demands from WWII in Europe resulted in huge orders for HRO receivers which rendered the argument for change moot. Years later, in retrospect, Millen believed that Hopkins' position stemmed from a desire to maximize his stock value because of his ultimately terminal health issues and had nothing to do with National's long-term success. It seems that Millen had gone to Washington D.C. to discuss the use of the HRO receiver in the military. At the meeting, Millen supposedly represented himself as president of National. Millen's "high profile" at National (and in National's advertising) did seem to promote the belief that Millen was "in charge" so apparently the "Washington crowd" believed that they were dealing with National's CEO. Somehow word got back to William Ready (the actual president of National Company) who was livid. During the meeting at National (upon Millen's return) Millen was asked to resign, which he did. It seems like an over-reaction on Ready's part, especially since the National-Millen publicity promoted the impression that "Millen was the CEO" through most of the thirties. During the thirties, even Sears-Roebuck got into the communications receiver market by offering their Silvertone Model 5656A, built by Howard Radio Company in 1937. 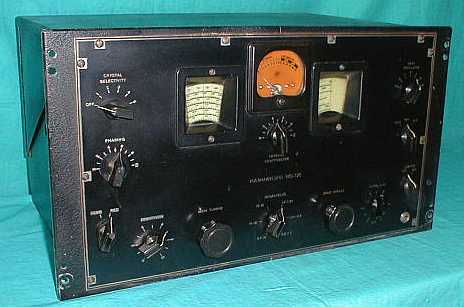 The receiver was an eight tube superhet with three tuning bands covering .55 to 18.0 MC. Also included was variable coupled IF for adjustable selectivity, an eight inch diameter tuning dial with multi-colored scales that somewhat compensated for the lack of a bandspread, an AVC switch with separate Sensitivity Control (IF Gain) and a built-in 8" Jensen speaker. It is likely that the screen-grille was originally flocked with some kind of mohair - this was typical of the screen grilles of the day. The BFO was built on a separate small chassis. The 5656A provided the basic ham necessities and performance was surprisingly good with sensitivity and stability that was hard to find - even in more expensive receivers. The PR-15 receiver was designed by Karl Pierson in late-1936 for Patterson Radio Company. Pierson had designed the Patterson PR-16 in 1935 and it was a fairly successful receiver. It had its quirks, such as the parallel-connected RF amplifiers that allowed Patterson to advertise the receiver as having "two RF amplifiers" and yet only have a single set of RF coils making the PR-16 essentially a single pre-selection receiver. However, the PR-16's powerful audio section sold the receiver and its performance was more than adequate for most hams. Karl Pierson had designed the PR-16 in just a few weeks, rushing it into production to get Emmitt Patterson "off the hook" for the PR-12 Communications Receiver debacle. Pierson decided that his next design was going to have up-to-date circuits, great bench presence and modern performance. Thus the PR-15 was born. Using 15 tubes, the PR-15 circuit features actual double preselection on all bands (two TRF amplifier stages,) two IF amplifiers operating at 465kc, Crystal Filter, a tuned Noise Silencer similar to the Lamb Noise Silencer, an Interchannel Noise Supressor (aka Squelch,) Red and Green lamps to indicate "Transmit" and "Receive," fixed bias on first AF amplifier grid provided by a battery cell, push-pull audio output using a pair of 6V6 tubes, fold-down stand that elevates the front of the receiver for better visibility of the controls, magnifying lens for logging scale, vernier tuning and a carrier level meter (R-meter.) The "Communication" switch had a "Monitor" position that was supposed to allow listening to the station transmitter through the PR-15 speaker or headphones. Overall, the PR-15 was a very competitive receiver with performance capabilities equal to the top-of-the-line products from the "Big Three," that is, Hallicrafters, Hammarlund and National. Pierson left Patterson Radio Company in 1937 and simultaneously purchased all of Patterson's communications receiver manufacturing business, including the rights to continue building the PR-15. Since assembly of the receiver was accomplished at the Gilfillan Brothers plant in Los Angeles, the transfer of Patterson's communications business to Pierson really didn't affect the construction of the receiver. Other than the name change to Pierson-DeLane (after Pierson partnered with his investor, business adviser and VP, a Mr. DeLaplane,) the PR-15 appearance remained unchanged although there are a few examples around that are gray rather than black wrinkle finish. Pierson continued to build the Patterson PR-15 under the Pierson-DeLane name until about 1939. Pierson-DeLane then started manufacturing two-way radios up until they went out of business in 1943. Emmitt Patterson continued to build some consumer radios but eventually quit the radio business entirely in 1939. Note that this PR-15 (it's a Patterson) doesn't have the manufacturer's name on the dial. Instead the original owner's name, ~ Charles Morrison ~, has the place of honor. Charles Morrison was W6JVJ and he lived in and around Los Angeles, California. He had been a professional shipboard radio operator in the late-twenties and saw duty on the S.S. City of Los Angeles and possibly also on the S.S. City of Honolulu. Both ships were owned by the Los Angeles Shipping Company and were passenger ships that sailed between LA and Honolulu. Morrison moved to New Mexico in 1930 to work for Western Airlines but was back in LA within a few months, working for Pan-American Airlines. Morrison had an earlier, two letter ham call that is unknown. Morrison was an active ham into the 1990s. Exactly how Charles Morrison managed to have his name applied to the dial is unknown. Upon close examination after cleaning, it appears that the company name was never applied and that " ~ Charles Morrison ~ " (hand-lettered in matching silver paint) was applied at the factory during assembly of the receiver. Since Morrison lived in Glendale at the time (just outside Los Angeles) perhaps he was able to order the PR-15 directly at the factory and was able to have the dial for the receiver "customized." The factory, of course, was the Gilfillan plant. Guy Morrison, Charles Morrison's son, donated his father's Patterson PR-15 receiver to WHRM in 2018. Like the Breting 12, the Breting 14's "one and only" published schematic (in Rider's Vol. VIII) is fraught with obvious errors. An examination of the "14" circuit schematic shows that it's basically an "up graded" version of the Breting 12 with the addition of a Noise Silencer circuit (the reason for the two additional tubes,) the change over to all octal tubes and the elimination of the Volume Indicator meter. Most circuits are identical to the Breting 12 adapted to use octal tubes. Parts availability and substitutions certainly accounted for a lot of Breting's engineering changes that had to be accomplished on the production line. These changes were never documented. Therefore, most Breting receivers will differ somewhat from the schematic (many of the "14's" circuits wouldn't even work if wired like the schematic.) Also, due to the Breting's chassis assembly methods, each example of a Breting receiver will differ in minor component placement, lead dress and other minor details from other Breting receivers of the same model. Since nearly all Breting 12 and 14 receivers were owned by hams, nearly all receivers have had many repairs, replaced components (many times using incorrect values) and questionable modifications added over the years. This increases the difficulty in identifying what is correct for "factory original assembly" and what will actually function as Ray Gudie had intended. A restoration will probably need both the Breting 14 schematic and the "corrected" Breting 12 schematic to determine what is correct and original. The link to the corrected Breting 12 schematic is in the Breting 12 description in Part 1 of "Pre-WWII Ham Gear." Paul J. Breting started selling receivers in 1935 but his receivers were built at the Gilfillan plant, located at 1617 Venice Blvd. in Los Angeles, since Breting didn't have the required RCA license. Most of Breting's documents and advertising show another address associated with Breting, 2117 Venice Blvd. It's possible that this may have been a sales office that also allowed for final testing of the receivers there. As long as some part of receiver manufacture was under Gilfillan's supervision, that satisfied the RCA license agreement. It's probable that actual chassis assembly was at the Gilfillan plant since Breting could utilize Gilfillan's stock room, processes (like chrome plating the chassis,) machining, tools and other things associated with building radio chassis. Final Test and Alignment of the assembled receivers may have been at the second Venice Blvd address. 2117 Venice Blvd. is also shown on the schematic drawings and may indicate that engineering design and the minimal documentation was also accomplished at that address. Breting offered five communications receivers during their manufacturing history, the Breting 6 (really a SWL receiver,) the Breting 9, the 12, the 14 and the 40. Breting may have offered some entertainment-type radios but the documentation of this is non-existent and the authenticity of the scant number of examples is questionable. Breting went out of business in 1940. Utah Radio Products sold many different types of radio components from the 1920s up into the 1950s. Although mainly known for loudspeakers in the 1920, Utah also produced various type of transformers and chokes along with many other radio components. In 1937, Utah introduced the "Add-A-Unit" series of transmitter kits. There were five different kits that could be purchased with the designation being "Kit No.1," "Kit No. 2," etc., up to "Kit No. 5." Kit No. 2 was a 50 Watt Modulator priced at $44.50. Kit No.3 was the Antenna Coupler priced at $13.95. Kit No. 4 was a 500 Watt input RF amplifier priced at $49.75. Kit No. 5 was a 250 Watt Class B Modulator priced at $49.75. When all five kits were assembled together, the builder ended up with a 500 Watt AM-CW transmitter. The idea of "Add-A-Unit" was driven by the Depression and the fact that most hams didn't have the money to purchase all of the kits simultaneously. A prospective builder could start with Kit 1 and probably Kit 3, which would result in an 80 Watt CW crystal-controlled transmitter that could be matched to several types of antennae. Later, Kit 2 could be added for AM operation. Then perhaps last, Kit 4 and Kit 5 could be added giving the builder a complete 500 Watt AM-CW transmitter with the purchase spread out over the time necessary. Shown to the left is the UAT-1 80 Watt transmitter and a copy of Kit 3 Antenna Coupler. The coupler requires balanced feed line going to a dipole antenna. I usually can get about .6amps of RF antenna current. I had a two-way QSO with K7RLD (Washington state) with this set-up. K7RLD was using his Utah UAT-1 transmitter. Probably the first two-way UAT-1 QSO in several decades. 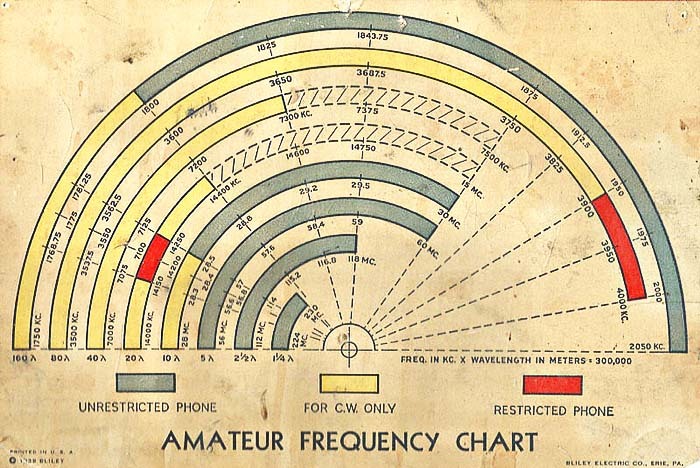 Did you ever wonder what the granted ham frequencies were before WWII? Shown to the right is a 1939 multi-color chart put out by Bliley Electric Company, the famous quartz crystal manufacturer. 160M band shows 1750kc up to 2050kc. It was the popular Phone band because it could be used by newly licensed hams (Class B.) 50kc was CW only. The 1936 ARRL HB shows the lower end of 160M as 1715kc at that time. 80M was the same frequencies as today but was CW only except for 100kc Phone for Class A licenses. 40M was the same frequencies as today but was totally CW only. 20M covers 14.0mc up to 14.4mc and only had a small 100kc section for Class A Phone. The remaining 300kc was CW only. 10M was from 28.0mc up to 30mc and allowed Class B licenses to operate Phone from 28.5mc up to 30mc. 500kc was CW only. "Restricted Phone" indicates Class A license. "Unrestricted Phone" was for Class A or Class B licensees. Class A required one year experience and a more difficult test. Class B required no experience and a less difficult test. Class A, B or C had a 10wpm code test requirement. Class C license was the same privileges as Class B but testing was administered by mail and volunteer examiner. In 1936, James Lamb and James McLaughlin custom-built an elaborate dual-diversity receiver for XE1G, Dr. James Hard, a wealthy and enthusiastic ham in Morelos, Mexico. In 1937, McLaughlin and Karl Miles, Chief Engineer for Hallicrafters, designed a version of the XE1G receiver for production. Hallicrafters began advertising the Dual Diversity DD-1 in June 1938. The dual diversity design utilized a shared local oscillator to provide single dial tuning which drove the seven-gang tuning condenser. Main tuning is accomplished with the left-side dial and bandspread uses the right-side dial. The massive Yaxley-built push-button switch assembly controlled AC power and bandswitching. The four meters monitored signal levels in each receiver, the signal balance between the two receivers and the common AVC line in S-units. 26 tubes are used in the DD-1, including the four VHF 1851 RF amplifier tubes which allowed the receiver to tune up above 40MC. The table version was to sell for about $300 for the basic receiver without the Power Supply, Power Amplifier, Diversity Action Meters or speaker, (these accessories increased the basic price by $120.) The DD-1 Console version included the fabulous 15" Jensen Ortho-Dynamic High Fidelity Speaker in a Hagstrom-designed Deco-styled Bass Reflex cabinet along with a matching wooden top housing the diversity action meters. The DD-1 Power Supply and Power Amplifier chassis were stowed on shelves built into the rear of the speaker console. The DD-1 Console was priced at $500 - nearly the price of a new Chevy coupe in 1938. The prices escalated to $627 for the table version and an incredible $720 for the second production run models sold in 1939. Not surprisingly, the DD-1 was only seriously advertised for about six months (last QST ad was 1/39) but the DD-1 was shown in the Hallicrafters' line-up in the 1940 ARRL Handbook. Total production is thought to be around 120 receivers. As a specialized receiver it confirmed that Hallicrafters' engineers were capable of sophisticated designs but this "over-the-top" creation certainly wasn't what the Hams of the late thirties would have purchased for their station receiver. The DD-1 shown to the left is SN 80596, the highest known serial number from the initial production run. This DD-1 was on display in our Western Historic Radio Museum from 2002 until we closed the museum in 2012. It is shown as it now looks in its new nook located at our new QTH in Dayton, Nevada. For the ultimate information source on the Skyrider Diversity DD-1 including Estimated Production, Serial Number Assignments, Performance, Known DD-1 Serial Numbers, Photo Gallery of other DD-1 receivers, History of Diversity Reception plus many details on our Restoration of our DD-1 SN:H-80596.....click on "Hallicrafters DD-1 - Restoration and History of Diversity Reception" at the bottom of this page. Introduced in October 1939, the SP-200 series offered the same uncompromising quality of its predecessors while thoroughly updating the receiver to 1940 design specifications and reducing the cost of production so the receiver could list for about $315. Some of the changes from the earlier Super-Pro was the redesign of the IF amplifier section to use three stages followed by a conventional duplex diode detector tube, the 6H6. Additionally, the amplified AVC circuit was simplified with capacitive coupling pickup and reduction of the transformers to one unit. 16 metal octal tubes were used in the new receiver with two glass rectifiers in the power supply bringing the total to 18 tubes. The new Super-Pro still featured double preselection on all bands, variable coupled IFs (variable bandwidth) but added an improved Crystal Filter, a new illuminated S-meter with 0 to 9 scale that was connected to the AVC circuit so it worked normally (the early Super-Pro "Tuning Meter" measured total IF plate current and worked "backwards") and a brand new Noise Limiter circuit. The powerhouse audio still used triode connected P-P 6F6s w/ 6F6 driver and produced up to 14 watts of high-quality audio power. The suffix letters designate the frequency coverage with X (.54-20MC), SX (1.2-40MC) and LX (100-400KC and 2.5-20MC) models, (all SP-200 series receivers had a Crystal Filter and therefore the "X" option.) Early versions of the SP-200 feature a Speaker/Phone switch, standard vertical mount audio transformers with 8 ohm audio output Z and a wrinkle finished aluminum front panel. Later versions have a front panel phone jack, potted audio transformers with dual outputs (600 ohm speaker and hi-Z phones) and semi-gloss finished steel panel (the front was copper-nickel plated under the paint for corrosion protection.) The separate power supply was updated to eliminate the field coil requirement on most models. Some sales information will denote the speaker size by using variations in the model number, e.g. SP-210 (10" speaker) or SP-220 (12" speaker) however, Hammarlund always used "200 Series" in their advertising. By 1942, a matching speaker cabinet, model PSC, was listed separately at $5.10, which implies that the speaker was still being supplied without a housing. Hammarlund also indicated in their advertising their willingness to supply the Super-Pro in any special frequency requirement per customer request and special order. The most commonly heard complaints about the Super-Pro receiver involve limited frequency coverage. Though this is somewhat true, one should bare in mind that the Super-Pro was a commercial/military receiver that could also be used by hams. Hammarlund offered the "ham version" of the Super-Pro in the "SX" option - 160M to 10M coverage. Most of the limited frequency coverage complaints were from hams who wanted the SX version but could only find the X or L versions. Long warm-up time was another complaint with ~2 hrs. required for minimal drift - but most pre-war receivers won't quit drifting any sooner, if ever! Besides, the SP-200 was designed to be left on continuously which eliminated the drift issue. 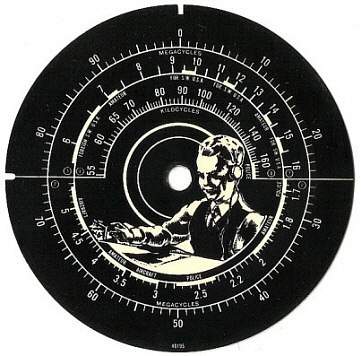 The non-calibrated 0-100 scaled bandspread dial brought more negative comments but since the Super-Pro was a commercial/military receiver also, it might be used anywhere in the frequency ranges so a calibrated bandspread wouldn't have been practical. Another common complaint was that high front-end tube noise limited the ability to copy very weak signals but this often-heard opinion was based on a popular modification article that appeared in CQ magazine, advocating replacing the front end tubes with miniature tubes (along with several other unnecessary modifications.) Actually, using a matched (or tuned) antenna would have been an easier solution. A matched antenna will help considerably in reducing noise and increasing signal strength. The Super-Pro does not have an antenna trim control and depended on the user to provide a matched antenna for best performance. Also, many users ran the receiver with entirely too much RF gain and too little AF gain resulting in high noise that tended to mask weak signals. The solution was to operate the receiver as a "communications receiver" and not as a "broadcast radio." 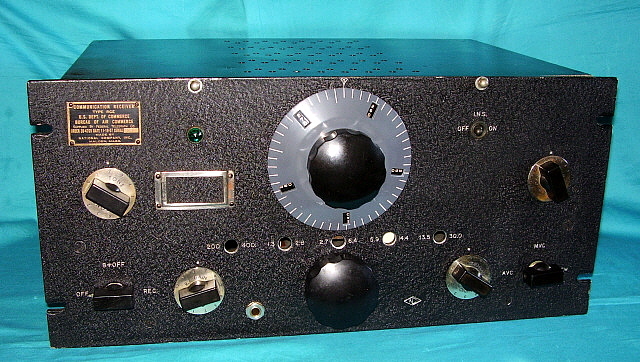 Today, the Series 200 Super-Pro is rarely encountered as the station receiver in a Vintage Ham Shack, probably from the many years of negative comments from hams who wanted to use this military/commercial receiver in their ham station and expected the receiver to have been designed exclusively for ham use, which it wasn't. The majority of SP-200 receivers encountered today are the WWII military versions and they have had years of hard use and probably a lot of abuse. Normally found in "rough" condition, the Series 200 Super-Pro will typically require total restoration to function at it design limits. When fully restored and aligned, the SP-200 series receivers are unbeatable performers. The military Super-Pro 200 Series receivers are generally identified with their Signal Corps designations of BC-779 (LX), BC-794 (SX) and BC-1004 (X.) These versions are more or less identical to their civilian counterparts. More information on the military Super-Pro receivers on the "WWII Receivers and Post-War Ham Gear" webpage. For the ultimate source of detailed information on the Pre-WWII Hammarlund Super-Pro receivers, including Product History, Estimated Production, Serial Number Assignments, Performance and Restoration, click on "Hammarlund Mfg. Co., Inc. - The Incredible Pre-War 'Super-Pro' Receivers" in the index at the bottom of this page. Hammarlund realized that the Super-Pro was far too expensive for the majority of hams and that it was really a commercial-professional receiver that wasn't specifically designed just for the ham market. So, Hammarlund designed and built a receiver that was designed just for the ham market, the 12 tube, HQ-120X, (introduced in 1939.) 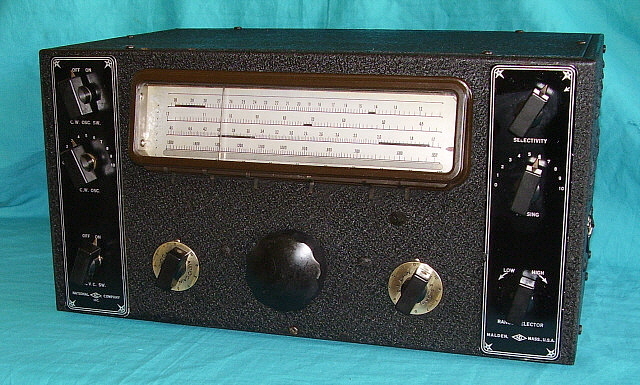 To keep the selling price within the typical 1939 ham's budget, the circuit uses a converter tube, single pre-selection, single-ended audio and a built-in power supply but frequency coverage was .54 to 30MC and ham band calibration was provided on the bandspread dial (generally credited as the first ham band calibrated bandspread available.) Selling price listed at $230 but the receiver usually sold for around $190 (or less) from most dealers. The HQ-120X was popular and provided decent performance on shortwave and ham bands up to about 15 Mc. Beyond that, images and lack of sensitivity become a problem. Late in production, a special gray painted version was offered. The U.S. Navy also had versions built and designated as the RBG or CHC-46140, though the tube line-up is slightly different from the civilian HQ-120X. 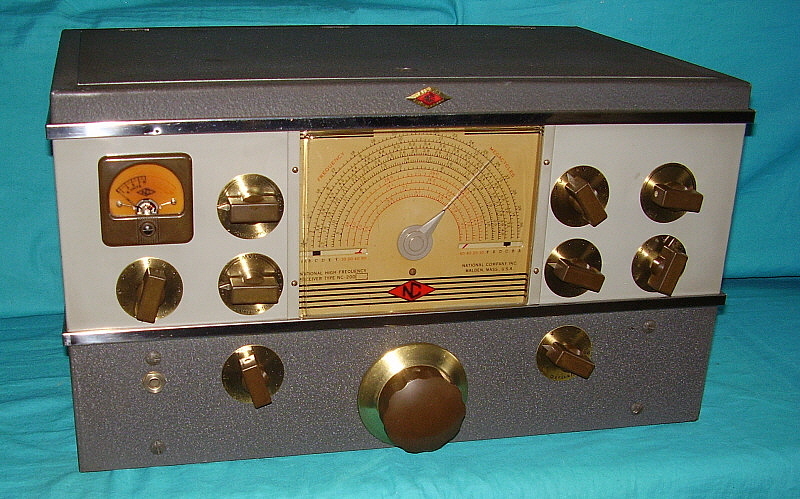 The HQ-120X was the first of a long line of "HQ" receivers built by Hammarlund specifically for the ham market. Shown in the left photo is a black finish HQ-120X with the unusual rack-mount option with an extended front panel and rear dust cover but with feet on the bottom to allow table-top use. The right photo shows the HQ-120X in the standard table cabinet with the later production gray finish option. By 1942, the gray finish had become standard and black finish was a special option. The manual recommends that the IF transformers be aligned since the Crystal Filter provides a very narrow bandwidth on 456kc. It would be fairly easy to provide an accurate frequency from a test oscillator by "sweeping" the IF to determine the exact crystal frequency. Then the IF transformers would be aligned to that signal frequency. The manual continues in stating that unless an accurate signal generator is used for RF tracking alignment, it's best to leave the front-end with the factory alignment. Typical of pre-WWII ham radio kits, the Traffic Scout instructions are not very detailed (compared, for example, to the typical Heathkit instructions.) An excellent drawing of the underneath of the chassis was provided along with a schematic. The remaining instructions are written in the order that the receiver should be assembled. Complete instructions are written within a few pages and then the drawing and schematic. At the time, building or homebrewing was part of being a radio amateur. The advantage of the typical ham radio kit was that all of the sheet metal work that would require expensive tools was already done. Alignments that required expensive, precision equipment were already done. That left the kit builder with just the task of assembly, wiring and basic testing to then have a professional-looking, decent-performing receiver. It also gave the kit builder the "bragging-rights" that his receiver was "home-built." The masterpiece of pre-WWII Hallicrafters receivers. 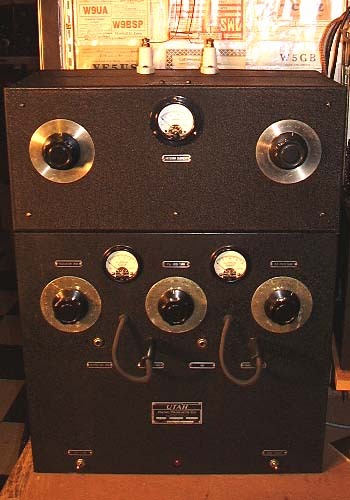 Introduced in July 1940, the SX-28 circuit boasted 15 tubes, covered .55 to 43MC in six bands, had P-P audio, ham band calibrated bandspread, Lamb Noise Silencer, Amplified AVC, on and on. Hallicrafters advertised that the SX-28 had been designed by 12 of their engineers based on 600 requested reports including input from the Government. The styling was beautiful and the performance incredible. 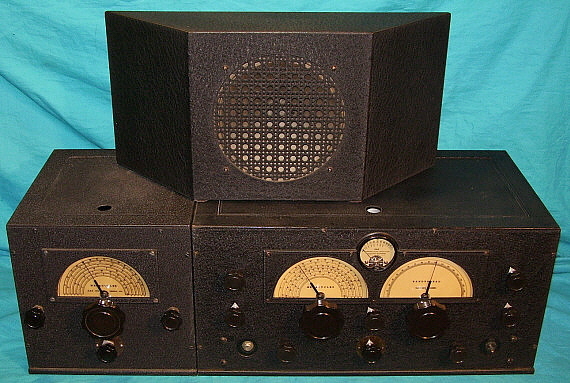 Early versions of the SX-28 have gray panels but starting in 1941 the panel color was changed to black. About the same time the Lamb Noise Silencer was redesigned. A few months later the bandspread gearbox was replaced with a dial string drive. There were many engineering design changes throughout production. 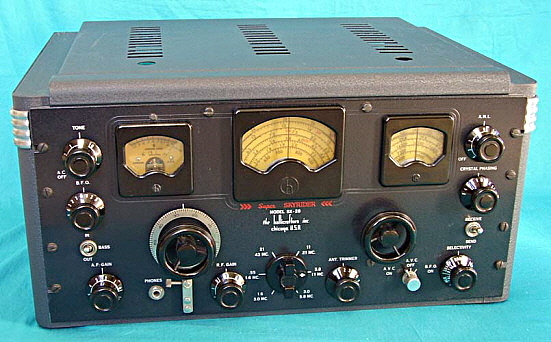 During WWII, Hallicrafters continued to redesign portions of the SX-28 and, in April 1944, a major redesign to the receiver's front-end prompted a designation change to SX-28A. The old front-end coils were replaced by smaller, Hi-Q Micro Set types that were mounted on removable chassis. The new coil design eliminated the majority of brass parts that were used in the early style coils. After WWII, Hallicrafters had nothing new to sell the hams as they had devoted all design and manufacturing to the war effort, so they offered the SX-28A as a 1946 model. The last 4000 SX-28As built have "SX-28A" indicated on the front panel (indications are that the "A" appeared around September, 1945.) Hallicrafters published that 50,000 SX-28s (and SX-28As) had been built by 1946, however the serial numbers seem to indicate a production figure of about half that amount, around 27,500 receivers. Nowadays, many SX-28s and SX-28As are still being used in vintage AM ham stations because of their fabulous audio quality and classic "good looks." Most ham AM operators find the sensitivity, selectivity and stability quite acceptable for communications on vintage AM nets today. The SX-28 (SN H-151197) shown above belonged to W3ON, John Ridgway (SK), who purchased it new in February 1942. In 1997, at age 85, John sold his receiver to me saying, "...it's so damn heavy, I can't even turn it on its side anymore." The W3ON SX-28 is in superb, all-original condition and is an excellent example of how the pre-WWII SX-28 looked when new. During early production of the SX-28, three different speaker options were offered. The PM-23 was a 10" speaker in a table top, metal case. The R-8 was a small bass reflex cabinet with 8" speaker and the largest speaker offered was the Hallicrafters-Jensen Bass Reflex floor speaker, the R-12. Selling price was $29.50 and, together with the $159.50 that the SX-28 cost, represented quite a substantial investment in 1941. The R-12 uses a Jensen 12" PM speaker with 5000 ohm to 8 ohm transformer. The cabinet is constructed with panels made from solid lumber core with soft wood veneer. Paint was a dark silver color except for the decorative incised arch over the speaker opening that was filled with red paint. The cabinet panels are held together entirely with small internally mounted clamps. This method of assembly allowed the speaker to be shipped in a flat box. Originally, the wire screen grilles were flocked with a champagne colored mohair but most surviving examples have lost their flocking with years of use. The SX-28 (SN H-130170) & R-12 combination shown to the left was purchased as a "set," new in mid-1941, by W6ANX, Theron "Woody" Woods. The combo was found in the basement of Wood's house in Auburn, California around 2004. The R-12 was in dismal condition with warped boards and missing veneer. The receiver functioned but not as it should have. Rebuilding the R-12 required total disassembly and straightening the panels. The straightening process involved wetting the panels and then clamping them to flat surfaces until thoroughly dry. After this, the soft-wood veneer pieces were glued and new pieces glued to replace the missing pieces. The paint was matched from the protected paint on the "h" grille. I didn't bother with the flocking of the grille screens since all of the R-12s I've seen don't have any flocking anymore. Also, it would have required mixing up a batch of special color felt that probably wouldn't have looked right anyway. H-130170 was completely rebuilt. Only one strange problem was found. The slug of the third IF transformer had come loose and was at the bottom of the slug barrel. Since this transformer is a capacitive adjustment, the IF would peak but it was not really tuned. The output level was far below normal which was the clue that something was wrong. I replaced the transformer with a good one from a parts set. Both H-130170 and its matching R-12 sound incredible now with loads of bass response and great performance. National had great success with the "Moving Coil" receivers that used a coil "catacomb" band changing mechanism. However, the NC-100XA, was a general coverage receiver only with no band spread capabilities and the NC-101XA was a "ham bands only" receiver. National engineers essentially combined the features of both receivers into their new, 1940 model, the NC-200. Introduced in October 1940, the NC-200's appearance was strikingly different from the former, all black wrinkle finish, cabinet models. Following the trend of offering gray painted cabinets as options or as the standard finish, National decided to offer even more with a two-tone gray cabinet with the dark gray in wrinkle finish and the lighter gray in smooth finish. The cabinet was trimmed with dual "wrap-around" chrome bars. Large sheet metal louvers were incorporated into each side of the cabinet. The matching loud speaker featured the same two-tone gray paint trimmed with chrome bars. Inside was a 10" diameter Jensen PM speaker. The NC-200 circuit featured several improvements over its older brothers from the NC-100 family. The coil catacomb reduced the size of each coil chamber and that allowed squeezing in one more tuning range for a total of six general coverage bands spanning 490kc up to 30.0mc. By adding two more stub-pins to the contacts of each of the coil assemblies, a band spread function could be realized. This feature was added to the four upper ranges of the general coverage bands, allowing band spread coverage of the 80M, 40M, 20M and 10M ham bands. To change bands required the user to pull on the main tuning knob. This disengaged the tuning and engaged the pinion gear into the rack gear for changing bands. One full turn would change bands for general coverage. Between the upper bands, one could select a position "between" the one turn rotation (about one-quarter turn) where the band spread pins engage. This would allow the receiver to then operate in band spread for the particular ham band selected. To ease the operator's identification of which band had been selected of the ten ranges available, a dual articulated flag system was viewed thru slots that flanked the tuning dial pointer hub. Some of the tubes that had been used in the NC-100XA were updated in the NC-200 circuit with the most obvious change being the replacement of the push-pull 6F6 tubes with push-pull 6V6 beam-power pentodes delivering about 8 watts of audio power. Additionally, the RF amplifier and one of the IF amplifier tubes were changed from 6K7 tubes to 6SK7 tubes. AVC and BFO functions used 6SJ7 tubes to replace 6J7 tubes. The old 80 rectifier was replaced with a 5Y3G. The NC-200 eliminated the interstage coupling transformer formerly used and replaced it with a phase-inverter circuit that repurposed one of the triodes of the 6F8 tube. Twelve tubes total were used in the NC-200's single-preselection superheterodyne circuit. The IF was changed from National's usual 456kc to the industry standard 455kc. A new 455kc Crystal Filter was incorporated into the circuit and featured a six-position switch to select various stages of selectivity along with a Phasing control. The S-meter used a new Marion Electric model that had a square flange although the scale inside is the same as the older, round flange meters. The S-meter toggle switch that was used on the NC-100A receivers was replaced with a switch that was incorporated into the RF Gain control. Only when the RF Gain was at maximum (full CW) was the S-meter switch actuated (of course, the AVC had to be switched on for the meter to read signal strength.) A series valve (clipper) type Noise Limiter and a variable Tone control were also part of the circuit although both of these improvements had been incorporated into the last of the NC-100XA receivers. Battery operation was possible utilizing the seven pin auxiliary socket located on the rear apron of the chassis. The NC-200 sold for $147 in 1940. National listed the models as NC-200TG (without matching speaker) or NC-200TS (with matching speaker.) Also, with R substituted for the T if the model was rack mount style. There was also a "TGM" version that eliminated the bandspread and was probably for commercial or military applications. Most of the pre-war NC-200 receivers were built within two production runs identified by letter prefixes and starting with the letter C. Run C, probably started in September 1940 and probably produced just under 1000 receivers since the serial numbers go up into the mid-900s. Run D probably started around mid-1941. It also seems to have produced fairly high quantities of NC-200 receivers, probably around 800 to 900 receivers. Run E was probably started sometime in 1942 and ran thru most of WWII. Run E was used for the remainder of the NC-200 family which included the WWII NC-200FG that eliminated the ham band spread feature. 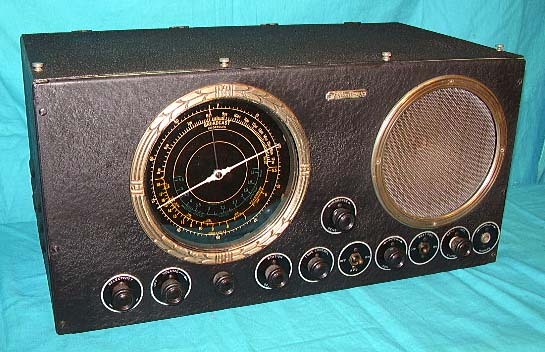 This receiver later became the NC-240C. When the AM BC band was replaced with a 200kc to 400kc band, the receiver was designated NC-240CS. Production run F seems to have been shared with the NC-240CS and the post-war NC-240D (early versions only - later NC-240D receivers use a seven digit SN.) Ultimately, around 1800 pre-war NC-200 receivers were probably produced thus making those versions fairly uncommon. Silver Anniversary NC-200 - In December 1940, National introduced the Silver Anniversary NC-200. But,...whose anniversary was it? Surprisingly, it wasn't National's. December 1940's QST was a special issue that celebrated QST's "Silver Anniversary" (25 years) with a silver cover on the magazine and with the inside loaded with articles on the origin of ham radio, the ARRL and QST. On the back-inside cover, National had a full-page ad that introduced the Silver Anniversary NC-200. The ad states that this special version of the NC-200 was "Dedicated to amateurs on the twenty-fifth anniversary of their own QST. A toast to QST, the ARRL and the Amateur!" This version of the NC-200 had a special NC-diamond insignia installed that had "SILVER ANNIVERSARY" embossed around the perimeter. The special NC-diamond was also installed on the matching loudspeaker housing. Additionally, the receivers were equipped with special brown bakelite knobs and a brown bakelite S-meter housing. Also, the special NC-diamond, the tuning knob's skirt and all of the control nomenclature plates were finished in "gold tone." National wasn't consistent in the Silver Anniversary trim however and some receivers will be found with off-white or cream color dials, black knobs or a very light gold tone finish. Only the "Silver Anniversary" <NC> diamond insignia remained consistently installed throughout production. Silver Anniversary NC-200 receivers were built during the early-production of run "C" and into mid-production of run "D." Though it would seem like both Standard Finish and Silver Anniversary models would have been available during this time period, it's very possible (and reported serial numbers seem to confirm) that only Silver Anniversary models were produced for a considerable time period. Shown above is a Silver Anniversary NC-200 model with the serial number C-536 and probably dates from early-1941. 1. "Communications Receivers - The Vacuum Tube Era, 1932-1981" by Raymond S. Moore - Undoubtedly the best reference book on tube-type superheterodyne communications receivers. History of receivers and the companies along with circuit description and photos of each receiver. Four editions have been printed. 2. "Shortwave Receivers Past & Present - Communications Receivers 1942-1997" by Fred Osterman - Excellent reference book on later communications receivers. Includes many foreign makes. Circuit descriptions, photos, prices. 3. "Los Angeles Radio Manufacturing - The First Twenty Years" by Floyd Paul - Details the history of Gilfillan Bros., Inc and their licensing relationship with RCA. Many smaller LA companies are also covered. 4. QST, Radio News and Shortwave Craft magazines from 1928 up to 1948 - These vintage magazines are excellent sources for contemporary reviews of equipment and pre-production articles by the designers. Advertisments are invaluable for dating and development of the model line. 5. Operator's Instructions, Factory Manuals, Rider's Troubleshooting Manuals - Original manuals are excellent sources for circuit descriptions, design intentions and performance expectations. Many times the same information is included in the appropriate Rider's Troubleshooting Manual.